The family of Akio Morita, founder of Sony Corporation, can be traced back to the beginning of the Edo Period in the early 17th century. In his capacity as fifteenth-generation head of the family, he would have been known by the traditional name of Kyuzaemon Morita XV. The first Kyuzaemon Morita established a sake brewery in Kosugaya Village, at the center of the Chita Peninsula in Aichi Prefecture (now part of Tokoname City). According to a 1681 survey of sake breweries in the feudal domain of Owari, he had been brewing sake since 1665. He served as headman of the village of Kosugaya, and his brewing enterprise expanded under the patronage of the Lord of Owari. In 1708, he began to manufacture tamari sauce and the culinary paste miso, both of which are produced by the fermentation of soy beans. 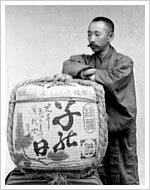 From about the time of the seventh and eighth-generation heads, the family expanded its business by selling high-quality sake in the capital city, Edo (now Tokyo). From about 1814, however, at the time of the ninth-generation head of the family, the fortunes of the business declined rapidly year by year as a result of competition from the sake brewers of Nada, in what is now Hyogo Prefecture, and Fushimi, near Kyoto. The tenth-generation head, Kyuzaemon Hidechika Morita, and his younger brother, the sixth child in the family, Kyuzaemon Meiki (1799-1894), endeavoured to restore the family's fortunes by improving their brewing methods to produce sake of a quality rivalling that of Nada and Fushimi. In his 1881 book Jiji Shogen (Brief Comments on Current Affairs), the great educator Yukichi Fukuzawa left a record of a conversation with Meiki that includes a detailed account of this revolution in brewing techniques. When his older brother Hidechika died in 1858, Meiki succeeded to the headship of the house as Kyuzaemon XI, and set out to secure the stability of the family business. One of his innovations was "diversified management." He bought three ships in collaboration with Tauemon Kugai, a sake brewer in a neighboring village, and established a regular route to Edo, with ships calling at the ports of Omaezaki, Shimizu, and Shimoda. On the return trip, the ships would carry cargos of fishmeal and oil cake bought in Edo to be sold as fertilizer in Hekinan and Nishio. The goods they sold in Edo were Handa vinegar, the family brewery's high-quality "Ne no Himatsu" sake, miso, and tamari. Sales increased rapidly. In 1853, in partnership with Matazaemon Nakano III of Handa, and a relative of his, Hanroku Nakano VII, Meiki bought a wholesale cotton goods business and opened a cotton goods store, thus initiating diversified management. In the late 1860s, at the time of the Meiji Restoration, he embarked on yet another new venture, the brewing of soy sauce. In 1875, by which time he had developed a full range of products, Meiki and Matazaemon Nakano IV, in partnership with Chogoro Yamamoto (also known as Jirocho Shimizu), established the Nakaizumi Genkinten in Shimizu, which was the forerunner of the present Ryoshoku Liquor Company. They expanded their sales routes from Suruga Bay to Tokyo and steadily extended their operations. After having set his own business on a firm foundation, Meiki began to undertake enterprises for the common good. At the time of the Tenpo famine in the 1830s, he and his older brother Hidechika jointly had given food and money for the relief of the villagers, and over a period of twenty years he made donations exceeding 5,000 yen for the rebuilding of Kosugaya's Hakusan Shrine. He built stone levees at Kosugaya port and along the coast and repaired the coast road. He also turned his attention to the Meiji government's Education Order. He provided all the resources for the establishment of a primary school, and selected Miki Mizoguchi to be the schoolmaster. He subsequently established a private school called the Raykay Gijuku School, which provided education at the same level as the government's "higher primary schools," and which turned out many pupils of great ability. Moreover, with the future of the Chita Peninsula in mind, he cleared land at Taketoyo and Rokkanyama and planted vineyards there, with the intention of producing wine. His dream was dashed, however, when the burgeoning vines were attacked by a nationwide blight of insects. Meiki was succeeded as head of the house by Kyuzaemon XII and Kyuzaemon XIII. During their time, sales of sake fell. The production of miso and soy sauce by new brewing families also increased, leading to a slump in the Morita family's sales. In the hope of restoring the family's fortunes, Kyuzaemon XIII formed a company called Morita Partnership, using additional capital invested by relatives. Cheap, poor-quality condiments manufactured on a large scale by the Chita County trade guild proved good enough for the people of this impoverished rural area, however, and the Morita family's sales entered a continuous decline throughout the region. Kyuzaemon XIII was unable to stem the resulting loss of assets. Kyuzaemon XIII's son Hikotaro was born in 1887. His mother was Chiyo, younger sister of Zenpei Morita (founder of Kabuto Beer and the Shikishima Baking Company). During his childhood and youth, Hikotaro watched his grandfather spend the family's fortune on his collection of antiques, and saw his father neglect the family business. 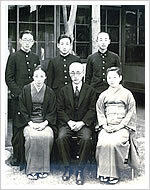 Back row from left: Kyuzaemon XV (Akio), Kazuaki and Masaaki (Akio's younger brothers). 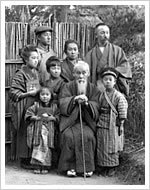 The greatest influence on the young Hikotaro was his great-grandfather Meiki. Hikotaro was only seven when Meiki died, but he grew up resolved to become a man like the great-grandfather who had set the business on a firm foundation through diversified management. 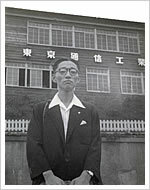 Hikotaro was educated at the Raykay Gijuku School, where he was taught directly by Miki Mizoguchi. He turned his eye to the business world, taking his mother's older brother Zenpei Morita as his model. 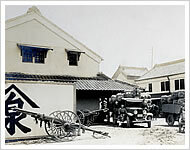 Zenpei took over Kabuto Beer from his uncle Nakano Matazaemon IV, built a western-style red-brick brewery in Handa and began to sell the company's beer nationwide. When he was just nine, Hikotaro accompanied his mother to the ceremony marking the completion of the new Kabuto Beer brewery in Handa. They walked along the main road built by his great-grandfather Meiki to Taketoyo Station. When they reached the station, Hikotaro was astonished by his first sight of such artifacts of "civilization and enlightenment" as rickshaws and steam locomotives. Astonished and inspired, he proceeded at the age of ten to the Raykay Higher Primary School. He took pride in the fact that Zenpei had been a member of the first graduating class at its predecessor, the Raykay Gijuku School. Here he and a companion, one of the older pupils, Taizo Ishida (then Sawada) studied hard and played together. After Taizo graduated, Hikotaro entered the fourth grade, where he devoted himself even more assiduously to his studies. On leaving the Raykay Gijuku School, Hikotaro continued his education at a high school specializing in agriculture and forestry at Anjo before proceeding to Keio University to study economics with the idea of re-establishing the Morita family's fortunes. But when he was in his sophomore year at Keio, Kyuzaemon XII died. Returning home for the funeral, Hikotaro used the knowledge he had acquired at university to check the assets of the Morita Partnership and the Morita family. He was surprised to discover that, as a result of declining sales and Kyuzaemon XII's mania for antique collecting, the family's assets had almost disappeared. Realizing that his own father, Kyuzaemon XIII, a man of easy-going character, did not have the strength to restore the company, Hikotaro made up his mind to rebuild the family business himself. He withdrew from Keio University in his second year and took charge of the family enterprises. He sold Kyuzaemon XII's antique collection at auction to provide the capital needed to rebuild the company. He also adopted the method of selling products directly to retail stores, instead of through wholesalers. Through the determined efforts of the company's employees, business gradually began to revive. He now moved the main branch to Nakanomachi, in Naka-ku, Nagoya, although the actual brewing continued to be done at Kosugaya. This formula of "selling your own products with your own hands" was inherited by his son Akio, who was expected to become Kyuzaemon XV. After Hikotaro had rebuilt the Morita Partnership, he succeeded to the family headship in 1933 as Kyuzaemon XIV. Japan was in upheaval, and the country had set out on the path to militarization. Japan was plunged into war in 1941, and a control economy was established. Since goods of all kinds were rationed, the Moritas' sales network was no longer needed. Akio, the eldest son, joined the navy as a technical officer. His younger brother Kazuaki had made up his mind to volunteer for the Navy Air Service, but it became more and more apparent that Japan's armed forces were heading for defeat and in 1945 the war ended with Japan's unconditional surrender. In 1946, Akio renewed his acquaintance with Masaru Ibuka and together they founded the Tokyo Telecommunications Engineering Corporation. Akio was the eldest son of Kyuzaemon XIV and had been brought up in the expectation that he would succeed his father as Kyuzaemon XV. When Akio explained about the new company he had set up with Masaru Ibuka, however, his father gave it his blessing, saying "If it's what you want to do, that's fine. I'm counting on you to do a good job." Not only did he understand Akio's dream and give him his moral support, he also supported him financially, selling land in Nagoya to provide 190,000 yen, a large sum at the time. This was how the Tokyo Telecommunications Engineering Corporation was established. In 1947, Kyuzaemon XIV became Chairman of the Morita Partnership and the absent Akio was made President, with Kazuaki, who had graduated from Waseda University, as Managing Director. Kazuaki subsequently watched over the family business as proxy fifteenth-generation head, and realized Meiki's dream of producing wine by establishing the "Chanmoris Winery."